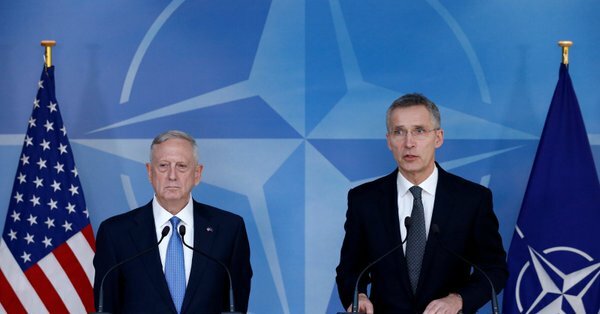 "BRUSSELS – U.S. Defense Secretary Jim Mattis on Wednesday issued a sharp ultimatum to NATO Wednesday, telling allies they must start increasing defense spending by year’s end or the Trump administration will “moderate its commitment” to them. He did not detail what the United States might do if NATO members failed to fall in line. Echoing a demand made repeatedly by President Donald Trump, Mattis said NATO must adopt a plan this year that sets milestone dates for governments to meet a military funding goal of 2 percent of gross domestic product. The Pentagon chief called it a “fair demand” based on the “political reality” in Washington. Attending his first NATO defense ministers’ meeting, Mattis tried to make his case by citing the threat from Russia. The gathering came at an awkward time for the United States, after Trump fired national security adviser Michael Flynn over Flynn’s communications with Russia before President Barack Obama left office Jan. 20. “Despite the threats from the east and south, we have failed to fill gaps in our NATO response force or to adapt,” he added. The warning reflects Trump’s wish for greater sharing of military costs. Trump has rattled European nations by suggesting the U.S. might not defend allies unwilling to fulfill their financial obligations as NATO members. Mattis didn’t go as far. British’s defense chief, Michael Fallon, said Mattis told NATO members that “Congress will not continue to tolerate unequal burden-sharing.” But Fallon said Mattis also appeared to welcome a British proposal to create a road map for increased spending by other countries. Along with the U.S. and Britain, the other countries that also reach NATO’s benchmark for military spending are Estonia, Poland and debt-ridden Greece. The United States is by far NATO’s most powerful member. It spends more on defense than all the others combined. The U.S. spent 3.61 percent of American GDP last year, according to NATO estimates — a level that has somewhat tapered off in recent years. Germany, by contrast, spent 1.19 percent of its overall budget on defense. Ten countries spend even less, and seven — including Canada, Italy and Spain — would have to virtually double military spending to reach the target. One, Luxembourg, would require a four-fold increase to get close. Mattis recognized Europe’s worries and the desire for clarity on America’s commitment to NATO. Trump has criticized the alliance as “obsolete” and repeatedly praised Russian President Vladimir Putin, stoking fears of a new U.S. approach to Moscow that includes lessened support for European allies near Russia’s border who worry about being the next target. The allies’ interest and concern about the latest furor in Washington was evident as officials crowded around televisions at the NATO meeting to watch Mattis’ initial appearance with Stoltenberg. Ministers immediately clustered around the retired Marine general as he entered the meeting room. Stoltenberg said he has spoken to Trump twice by telephone, and received similar reassurance from Mattis and U.S. Secretary of State Rex Tillerson. “They have all conveyed the same message,” he said, adding: “That is, that the United States will stay committed to the trans-Atlantic partnership.” "